Cross-posted from It's Getting Hot in Here - dispatches from the youth climate movement, by Richard Graves, founder of Fired Up Media. One week ago, Kingston, Tennessee, woke up to find that over one billion gallons of coal ash sludge had surged out of a poorly built and poorly maintained containment pond, one of three at the Kingston Coal Plant, after the dam holding back acres of inky black and toxic coal ash sludge failed. The Tennessee Valley Authority, the federal corporation that operates the Kingston Coal Plant, first reported that 360 millions gallons of coal ash sludge had flooded over 400 acres of local watersheds and river, then the estimate was revised to 540 million gallons, and now the best estimate puts the amount as over 1 billion gallons. This puts the amount spilled as more than 100 times larger than the Exxon Valdez disaster and, in fact, more than every drop of petroleum used in the United States that day. This coal sludge spill is simply unprecedented in size and scale and should become the stunning example of exactly how dirty coal really is. Numbers aside, as it is impossible to really comprehend the scale of the disaster in words - this is a very dramatic example of how our consumption and reliance on coal is quite literally reshaping our world. Whether by flooding 400 acres of beautiful Tennessee valleys and rivers with six feet of coal ash, or blowing the tops off of literally hundreds of mountains in Appalachia, or changing the global climate itself through massive releases of carbon dioxide - the coal industry has perhaps the greatest impact of any industry in the world - yet we barely know it. Coal plants intake almost 20% of the United States' freshwater, uses almost half of our freight railroad capacity, and leaves behind scarred landscapes, poor and exploited communities, kills vulnerable people - in fact, the Kingston Coal plant is estimated to cut short the lives of over 149 people a year - and coal is the leading source of global warming pollutants from the United States. Coal power devours landscapes, poisons the land and water, and yet it remains virtually unregulated in critical areas of impact. Smokestack emissions of sulfur dioxide (SOX), nitrous oxide (NOX), and mercury are regulated - to a certain extent - with SOX regulated through a Cap & Trade system that has been adopted by most large environmental groups as the mechanism to tackle global warming. However, federally mandated scrubbers on coal plants have led to the concentration of pollutants in coal ash, everything from arsenic, lead, mercury, thorium, and uranium. Yet, coal ash is not regulated as toxic waste - although the EPA is 'considering' doing so'. The Bush Administration has even worked at redefining the word 'fill' to allow the coal industry to be unregulated by the Clean Water Act and allow the destruction of mountains and pushing the rubble into streambeds and valleys. Carbon dioxide is still unregulated, despite efforts to pass a federal climate bill and the Supreme Court ruling that the Executive Branch is obligated to regulate greenhouse gases under the Clean Air Act. Unregulated, unaccountable, and corrupt is the way that many coal companies operate. Little surprise then that TVA announced as a safety measure that residents impacted by the coal ash spill should boil their water - thereby concentrating the heavy metal contaminants - instead of providing safe drinking water to residents. President-elect Barack Obama has tapped green jobs and immigrant rights champion Representative Hilda Solis (D-CA) to head his Labor Department, according to the Associated Press. 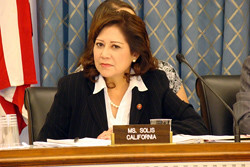 Representative Solis was the key sponsor of the Green Jobs Act of 2007 and has been a vocal champion in the House of Representatives for investments in a new, clean energy economy that can spark new innovation and offer pathways out of poverty for millions of Americans. As AP reports, the Democratic congresswoman was just elected to her fifth term . She is the daughter of Mexican and Nicaraguan immigrants and has been the only member of Congress of Central American descent. [Update: 1:29 PM, PST]: Two other nominations were made public today, both scientists with strong records as climate change advocates. Dr. Stephen Holdren, a professor at Harvard University and the President and Director of Woods Hole Research Center, a major center of climate science, will head the White House Office of Science Technology and Policy. Dr. Jane Lubchenco, a prominent environmental scientist and marine ecologist at Oregon State University has been selected to lead the National Oceanic and Atmospheric Administration. Dr. Lubchenco has studied the effects of climate change on marine species and co-chaired Oregon Governor Ted Kulongoski's Advisory Group on Global Warming which recommended actions the state could take to cut global warming pollution. Official announcements of the appointments are expected from the Obama transition team in the next few days. "We believe that aggressive support of energy science and technology, coupled with incentives that accelerate the current development and deployment of innovative solutions can transform the entire landscape of energy demand and supply. What the world does in the coming decade will have enormous consequences that will last for centuries. It is imperative that we begin without further delay." -Steven Chu (USA) and Jose Goldemberg (Brazil), Co-Chair's Preface, "Lighting the Way: Toward a Sustainable Energy Future." 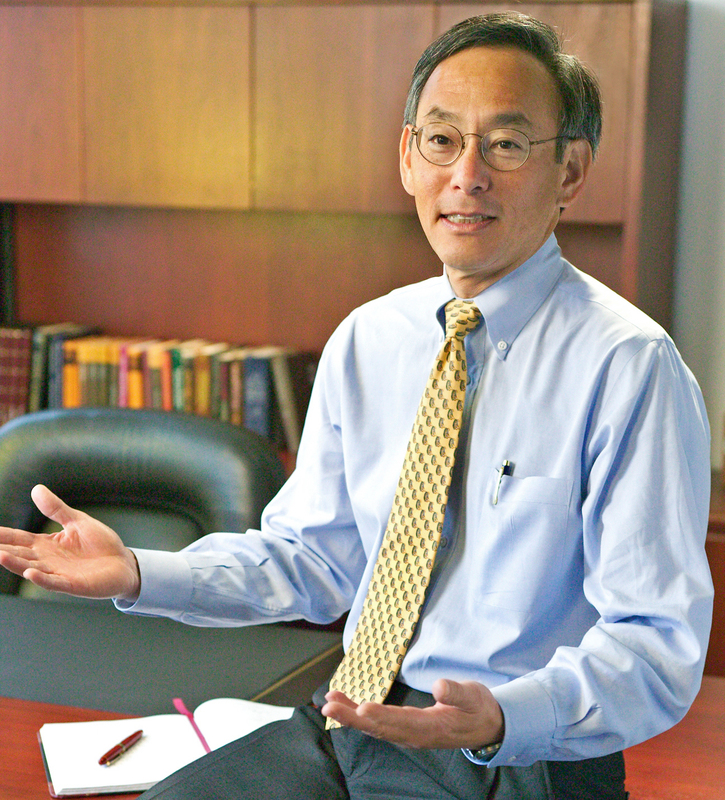 Dr. Steven Chu was just named as Barack Obama's choice for the next United States Secretary of Energy. BBC Says "Obama's First Real Challenge: Reducing America's Dependence on Coal"
The House Select Committee on Energy Independence and Global Warming held an important hearing yesterday on Bush’s 11th hour rule-making (see my previous post here). As most of our readers will know, one of those last minute rule changes is a repeal of the 25 year old Stream Buffer Zone rule - an important guard against the dumping of mountaintop removal mining waste into our streams. Robert F. Kennedy Jr gives the most significant and compelling testimony on mountaintop removal mining I have ever seen, and I hope you will take 10 minutes to watch him describe in his own words - and the words of his late father - exactly what is happening to the Appalachian Mountains. I’ve filed very detailed testimony about some of the worst of these actions, but I just wanted to give you a real life expression of what’s going on. I flew only a few weeks ago over the Appalachian Mountains over eastern Kentucky, and West Virginia mainly, and the Cumberland Plateau. If the American people could see what I saw on that trip, there would be a revolution in this country. We are literally cutting down the Appalachian Mountains, these historic landscapes where Daniel Boone and Davy Crockett roamed. The Appalachians, Chairman, were a refuge during the Pleistocene ice age 20,000 years ago when – where I live and the district Congressman Hall represents was under 2 miles of ice at that time. The rest of North America turned into a tundra where there was no forest. And the last refuge for those forests was the Appalachian Mountains. And when the tundras and glaciers withdrew, all of America was reseeded from the seed stock in those forests. So it’s the mother forest of all north America, and that’s why it’s the most diverse and abundant temperate forest in the world. Because it’s the longest living. And today, these mining companies with the help of their indentured servants in the White House are doing what those glaciers couldn’t accomplish. What the Pleistocene Ice Age couldn’t accomplish which is to flatten the Appalachian mountains and destroys those forests. They’re using draglines, which are 22 stories high. I flew under one of them in a piper cup. 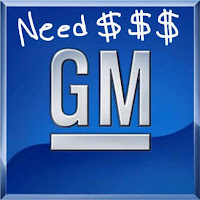 They cost 1/2 billion dollars and practically dispense of the need for human labor. When my father was fighting strip mining in Appalachia back in the 1960s – I remember a conversation I had with him when I was 14 years old – where he said they are not just destroying the environment, they are permanently impoverishing these communities, because there is no way that they will ever be able to regenerate an economy from these barren moonscapes that are left behind And he said they are doing it so they can break the unions. And that’s exactly what happened. When he told me that there were 140, 000 union miners in WV digging coal out of tunnels in the ground. Today there are fewer than 11,000 miners left in the state, a very few of them are unionized because the strip industry isn’t. 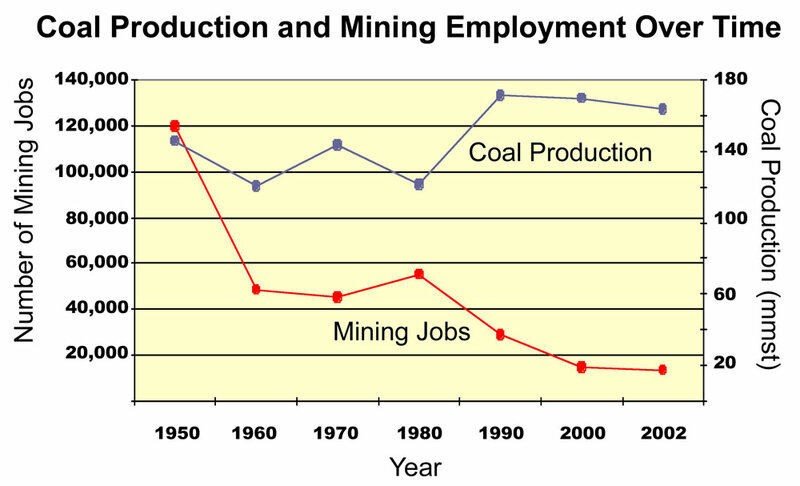 They are taking more coal out of WV than they were in 1968, but the difference is back then at least some of that money was being left in that state for salaries and pensions and reinvestment in that communities. Today, virtually all of it is going to leaving the state and going straight up to Wall Street to the big banking houses and to the corporate headquarters of Arch Coal, Massey Coal, and Peabody Coal – mainly Massey coal and then to the big banking houses like Bank of America and Morgan which own these operations. 95% of the coal in WV is owned by out of state interests which are liquidating the state for cash, literally, using these giant machines and 2500 tons of explosives that they detonate every day, in West Virginia - the power of a Hiroshima bomb once a week. They are blowing the tops off the mountains to get at the coal seams beneath, they take these giant machines and they scrape the rock and debris and rubble into the hollows and into the adjacent river valleys. They flattened out the landscapes, they flatten out the valleys. They have already flattened 400,000 acres of the Appalachian Mountains. By the time they get done, within a decade, if this rule goes through and you don’t succeed in getting rid of it, they will have flattened 2200 miles, - an area the size of Delaware. According to EPA they have already buried 1200 miles of America’s rivers and streams, these critical headwater streams that are critical to the hydrology and to the water quality and to the abundance of wildlife and the forests and the biota of those regions. Its all illegal. You can not in the United States under the Clean Water Act dump rock, debris, and rubble into a waterway without a Clean Water Act permit and you can not get such a permit. So, Kentuckians for the Commonwealth, and my good friend Joe Lovett sued the companies in federal court in front of a conservative Republican federal judge, Judge Charles Hayden, and he said during this hearing. He said to the Corps of Engineers Colonel, who was there to testify, “You know this is illegal. It says so in the Clean Water Act. How did you happen to start writing these permits to allow the companies to break the law, and engage in this criminal activity?” The Colonel answered, “I don’t know your honor, we just kind of oozed into it.” And Judge Hayden at the end of that hearing said exactly what I just said. Its all illegal, its been illegal since day one, and he enjoined all mountaintop mining. Two days from when we got that decision lobbyists for Peabody coal and Massey coal met in the back door of the Interior Dept with Gale Norton’s first deputy chief Steven J. Griles, who was a former lobbyist for those companies, and together they re-wrote they interpretation of one word of the Clean Water Act – the definition of the word “fill” to change 30 years of statutory interpretation and make it legal not just in WV, but in every state of this country to dump rock, debris, rubble, garbage, any solid material into any waterway in the united states without a Clean Water Act permit. All you need today, according to the Administration is a rubber stamp from the Corps of Engineers, which in some districts you can get through the mail or over the telephone. Now, the last vestige of protection that we had in WV was a Stream Buffer Zone law that was upheld also by Judge Charles Hayden, which said that you can’t do this if you are within 100 feet of a stream. Well this is the law today that this Administration is trying to get rid of before it leaves office to make it so there is absolutely no way - there is not a single obstacle or impediment - to these companies just coming and flattening the entire Appalachian chain. Barack Obama made public yesterday his intentions to appoint Dr. Steven Chu, director of the Lawrence Berkeley National Laboratory, as Secretary of Energy. Dr. Chu, a Nobel laureate clean energy expert, is well known for turning the Berkeley Lab into a center of clean energy and efficiency innovation, forging the Berkeley Lab-British Petroleum partnership, sitting on the Copenhagen Climate Council, and winning a Nobel Prize in physics in 1997. His appointment is probably most notable for the sharp contrast between the capable, knowledgeable academic and the past military officers, oil industry consultants and utilities executives who have served in the position. Last year, Chu was the co-chair of an InterAcademic Council Paper entitled Lighting the Way: Toward a Sustainable Energy Future. The report proposes "best practices for a global transition to a clean, affordable and sustainable energy supply in both developing and developed countries," focusing on policies to support the development and deployment of technologies "that can transform the landscape of energy supply and demand around the globe." If Lighting the Way is reflective of Chu's understanding of the energy challenge, he clearly sees it as a technology-driven global development challenge, a good sign that Chu is the right pick to head up DOE and it's many energy RD&D programs. Speaking at this summer's National Clean Energy Summit convened by Senator Harry Reid, Dr. Chu also evidences a keen understanding of the potentials of energy efficiency and the need for breakthrough renewable energy technologies. "Another myth is [that] we have all the technologies we need to solve the energy challenge. It's only a matter of political will," he says. "I think political will is absolutely necessary... but we need new technologies to transform the [energy] landscape." He then goes on to discuss the work on breakthrough solar and biomass technologies pursued under his leadership by LBNL's new Helios Project. Coming, as he does, from within the National Labs system itself, it will be interesting to see if Chu will advocate the sweeping reforms to America's energy technology innovation system we need. It's also unclear if Chu's academic acumen will translate well to a more political stage. But what does seem to be clear is that in Dr. Chu, Obama has found an able technologist with a keen grasp on both the technical and political challenges of creating a new global energy economy. Obama has also announced intentions to name Carol Browner, former EPA Administrator and current transition team advisor for energy and environment, as the administration's new "Energy and Climate Czar," and former New Jersey Environmental Commissioner Lisa Jackson to run the Environmental Protection Agency. "...we have the opportunity now to create jobs all across this country, in all 50 states, to repower America, to redesign how we use energy, to think about how we are increasing efficiency, to make our economy stronger, make us more safe, reduce our dependence on foreign oil, and make us competitive for decades to come, even as we're saving the planet." The world is halfway through the process to create a global climate treaty to respond to Global Warming. In the halls around me, government, NGO, and UN negotiators are painstakingly working through the process to create a draft text for this treaty. The last decade has been a period where climate campaigners and negotiators knew where they stood, with the Bush Administration blocking progress, the European Union leading on the UN process, and environmental organizations facing off against the Oil, Gas, and Coal industries. Suddenly everything has changed, with Obama’s election, the EU Climate Package failing, and the Canadians having a parliamentary crisis - a financial crisis dragging down the automobile companies - and newly emergent actors like the youth movement, trade unions, and justice advocates showing up onto the global scene. Nevertheless, with a financial crisis diverting attention from the climate crisis and backsliding among traditional advocates for strong international climate action - there is a lot of frustration and fear on the behalf of many Non-Governmental Organizations. One of the bright spots of the Poznan climate talks has been the arrival of large and energized youth delegations, including representatives of countries such as India, that have inspired many people here. Yet, despite the ever-growing level of international cooperation there remains two paths that this movement could take - that will have major consequences on the outcome of the global negotiations. Youth have strengths that they bring to these negotiations, but nothing is stronger than the moral voice and clarity they bring to the often intentionally complicated policy discussions that occur at the UN. Youth also have the potential to move, organize, and act on a speed that is matched only by the sophisticated online organizing outfits, like Avaaz.org, that have arisen recently. Young people represent more than the NGO sector and have government delegates, media representatives, youth union reps, and more. They also are willing to call for bold action, develop innovative strategies for advocacy, and have a passion that is palpable to anyone that has spent any time in their presence. Yvo de Boer, the president of the UNFCCC, in an Inter-generational Inquiry on the role of youth at these negotiations, was asked as to what role young people should play in these talks. He said that too many NGOs have bureaucratized and dropped their banners to put on suits. He said young people must raise the profile of this issue in their home countries, until their governments are forced to listen, if they hope to influence the outcome. For a UN diplomat, it was quite a statement - acknowledged that governments need to be pressured publicly and NGOs were failing to act and remained myopically focused on research, policy expertise, and lobbying meetings. Yet, it is not entirely clear which path the youth climate movement will take. Many of the delegations represented here have enormous policy teams, drawing students from research universities, that write policy submissions, follow discussions, and lobby delegates. One major proposal, has been for youth to serve as adjunct staff to delegations from Small Island and Developing States that are calling for strong action. Actions often remain rooted in efforts to influence particular policies being debated or discussed. Young people in suits are in abundance everywhere. Will these youth climate activists follow down the path of many NGOs and serve as a next generation of policy analysts, diplomats, and advocates? Will the main focus be on side-events, submissions, interventions, tracking the many ad-hoc working groups, and developing experience with the policy process? Or will youth climate advocates take another path? Will they develop campaigns that are fearless in their demands, huge in scale, and undertake actions even if it costs them access to delegates or representatives? There are campaigners here, from groups like the Rainforest Action Network (slogan: Environmentalism with Teeth”) that are willing to pick targets and hold people accountable. Avaaz.org and youth delegates last year served as the voice of conscience and fought a bruising battle with delegates from Japan, Canada, and USA last year. Will an international youth climate network serve as a secretariat and liaison group with the UN, or will it coordinate a global campaign that targets fossil fuel companies, politicians, and their lobbyists? Can these young people shake the pillars of power and authority with fearless tactics, digital strategy, mass mobilization, and boots on-on-the ground organizing? Now, before someone accuses me of promoting a false dichotomy or pigeonholing a movement that embraces a diversity of tactics - I understand that any movement needs a diversity of actors, but the question remains of how the effort, energy, genius, and resources of the youth climate movement will be directed. To read more about the emerging international youth climate movement, goto youthclimate.org or itsgettinghotinhere.org. Representative Henry Waxman of California defeated Representative John Dingell of Michigan in the battle for the gavel of the influential House Energy and Commerce Committee today. Over the past two weeks, the two senior Democrats waged one of the most hotly contested challenges for committee chairmanship in recent Congressional history. Waxman was announced the victor today after a 137-122 vote of the full House Democratic Caucus, ending Dingell's nearly 28 year reign was Chair of the committee, which has jurisdiction over several key issues, including energy, interstate commerce and health care. The vote, which upended the traditional Congressional seniority system, places a committed environmentalist and ally of Speaker of the House Nancy Pelosi in the top position on the committee, which will be ground zero for energy, global warming, and health care debates in the 2009 House of Representatives. Mr. Dingell, the longest serving member in the history of the House, has been one of the Detroit auto industry's strongest allies in Congress, and his ouster is further evidence of their declining influence on Capitol Hill. While Mr. Dingell has championed numerous environmental bills in his decades of service, including the Clean Air Act, and has been a consistent advocate of universal health care, he drew the ire of Speaker Pelosi and many more progressive members of the Democratic Party for being slow to advance climate change legislation and frequently siding with Detroit in opposition to higher fuel economy standards for cars and trucks. Mr. Waxman is widely considered the more liberal of the two, a fact Mr. Dingell used to argue - unsuccessfully - that he was the more likely to knit together the broad coalition of labor, industry and environmental interests necessary to fashion a politically successful climate change bill. Progressives and environmentalists are largely hailing Waxman's victory as another sign of the progressive mandate sweeping Washington DC. Waxman's victory is certainly a shift in the Congressional balance of power, and will no doubt make aggressive energy reforms more likely to pass the House of Representatives. But it remains to be seen if the new chairman can craft legislation that can secure victory in the Senate, where sixteen moderate Democrats are organizing to take control of the climate debate in the 111th Congress. In other Congressional news, Senator Joe Lieberman (I-CT) will keep his chairmanship of the Senate Homeland Security and Government Affairs Committee, but will lose the gavel of the Senate Environment and Public Works subcommittee with jurisdiction over global warming policy. Senate leaders were under pressure to oust Lieberman, a former Democrat who caucuses with the party, for backing Republican John McCain in the 2008 Presidential Election. Mark Begich, the current mayor of Anchorage, AK, and the Democratic challenger to Senator Ted Stevens (R-AK) was also announced victor in the tight Senate race yesterday. Begich, who trailed on November 4th, pulled ahead to secure victory as absentee ballots were counted over the past two weeks. Senator Stevens, who was convicted of felony corruption charges shortly before the election (the conviction is still under appeal), conceded yesterday, giving Democrats 58 votes in the Senate (including Independents Lieberman and Bernie Sanders of Vermont who caucus with the party). Two Senate seats are still contested in Minnesota - where election officials are launching a manual recount of ballots in the race between comedian Al Franken and Republican incumbent Norm Coleman - and in Georgia - where incumbent Republican Saxby Chambliss failed to secure a majority of the votes, triggering a mandatory run-off with Democratic challenger Jim Martin. Senate rules require a 60 vote super majority is needed to override filibusters, and these two remaining races will determine Democrats ability to pass that threshold.